Sea birds work the water and fish are jumping. State regulators are considering a series of rule changes for the striped bass fishery that could affect fishermen along the East Coast, including on the Vineyard. In recent years the commercial striped bass season has opened on June 23 or the first commercial fishing day after that date. 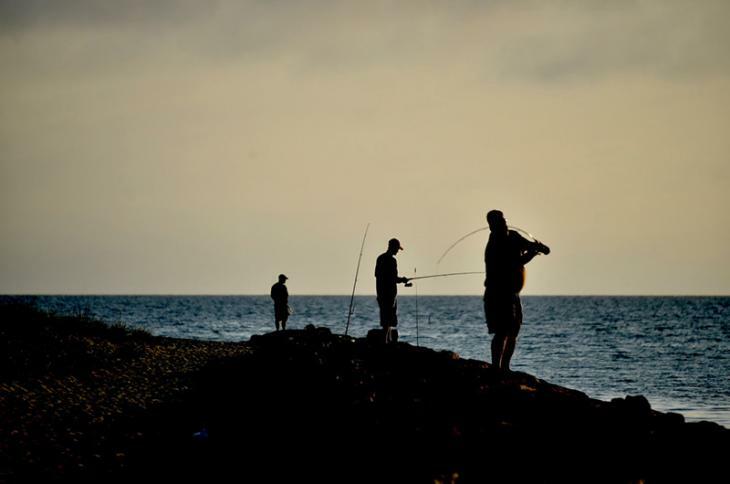 The proposed change would allow commercial fishing to begin on or soon after June 13. Commercial striped bass fishermen are only allowed to fish two days a week and can take up to 15 fish a day with a minimum length of 34 inches. Under the proposed rule changes, fishing days would switch from Monday and Thursday to Monday and Wednesday. Mr. Armstrong said the earlier opening is being proposed because commercial fishermen did not reach their quota last year. The quota for commercial landings was set at 847,585 pounds of fish, but only 753,731 pounds were caught, even with a mid-year extension of the season. The idea of an earlier commercial season doesn’t sit well with Cooper Gilkes, owner of Coop’s Bait and Tackle in Edgartown and a veteran recreational fisherman. 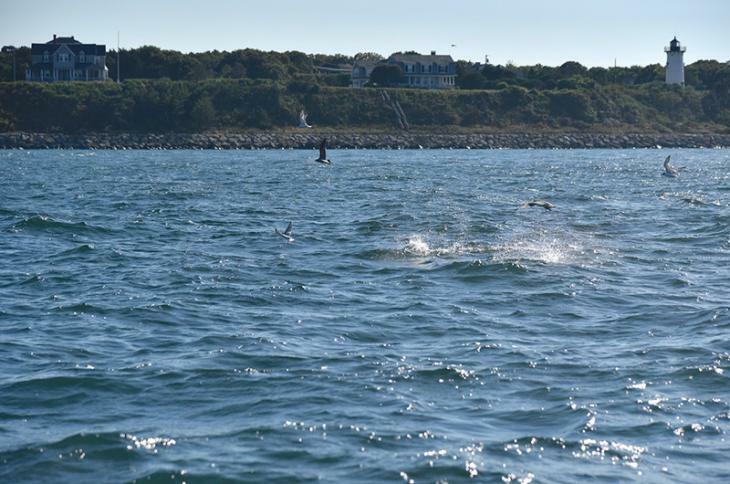 Joe El-Deiry, chairman of the Martha’s Vineyard Striped Bass and Bluefish Derby, said an earlier opening for commercial fishing likely would not affect the Island’s annual derby in September and October. Last year the extended commercial season lasted through the entire derby competition. “Starting 10 days earlier shouldn’t necessarily have an effect one way or another,” he said. He said the circle hook rule is aimed at less experienced fishermen. Mr. Gilkes said a universal circle hook requirement would handicap flyfishermen. Mr. El-Deiry endorsed the idea. Mr. Gilkes said he agrees with that rule change. But in general he disagrees with the theory that reducing mortality will revive declining bass stocks. Instead, he advocates increasing the minimum length for stripers, a method he said has worked before. The rule changes will be the subject of two public hearings. The first is on Feb. 25 at the Massachusetts Maritime Academy in Buzzards Bay beginning at 6 p.m. A second hearing will be held on Feb. 27 in Gloucester. Comments can be sent by e-mail until March 1 to DMF director David Pierce at marine.fish@state.ma.us. Comments by regular mail can be sent to Mr. Pierce at 251 Causeway Street, Suite 400, Boston, MA 02114. In a related story, the Striper Cup fishing tournament, one of the largest on the East coast, has eliminated weigh ins in an effort to conserve this great fish: https://www.stripercup.com/striper-cup-eliminates-weigh-ins/. The vineyard tourney should consider similar measures. Coop is 100% spot on. The experience from the last crash of the stock in the '80s is pretty convincing. Raising the minimum to 32" or 34" with a one fish per angler daily limit will allow many more fish to join and remain in the breeding stock. These changes need to be coupled with curtailing the catch of forage fish such as menhaden and herring so the food supply is also enhanced -- that's just as big a problem and must be part of the solution. He's also right that circle hooks should be required for bait fishing only. For fly fishing and artificial lures, a limit to a single hook (no more trebles on plugs) is adequate. Increase minimum size to 36" and back to 1 fish per day, drastically reduce commercial quota, no more new commercial licenses, consider purchasing back existing commercial licenses, derby should remove bass from prize structure(perhaps some catch and release category). Circle hooks are good idea. If I were King I would just ban all commercial harvest and require purchasing a striped bass tag in order for any recreational harvest but I was trying to throw out some suggestions that could possibly be implemented. Keeping tight restrictions on large scale commercial fishing for menhaden and squid will help restore a robust striped fishery as well. Perhaps they didn't get their quota last year because the population of striped bass is collapsing, and now they want to start earlier??? I agree with Coop. Yes, it is twisted logic. Im not so sure I agree that the stock is decreasing because over the last 5 years I have seen more fish and thicker schools. I have conistently caught more each year BUT I agree we need to decrease mortality. Having won the Striper Cup 2 years in a row I have consistently caught bigger fish each year but I release 99% of my fish and only kept the ones I could not revive. I think a bigger issue is the majority of fisherman do NOT know how to properly revive Striped Bass. I see WAY too many anglers just throw fish back without any effort to revive them. We have spent 20-30 minutes reviving one fish, missing a school blitz, in order to make sure that one fish swims away and down strongly. I have watched anglers throw fish back and ignored them when they floated back up......on several occasions we motored over to these fish and successfully revived them which is a good feeling. Circle hooks should be mandatory but anglers MUST understand that if one of these gets hooked low or gut hooked they are much more difficult to remove and the line should be cut immediately. I do not understand why gaffing Striper is allowed at all and it would be a smart move to eliminate that. Increasing the keep size is also good. We have a slot between 28 and 40 inches for the Hudson that you cannot keep and that has worked great for helping preserve the spawners. As for commercial fishing....I do not understand why that is allowed. Making Striper a game fish and eliminating commercial fishing might not be a bad idea. The DMF proposal to mandate the use of circle hooks when fishing for striped bass would not affect fly fishermen. The rule states: Beginning in 2020, mandate the use of inline circle hooks by anglers fishing for striped bass with whole or cut natural baits. This circle hook mandate would not apply to any artificial lure designed to be trolled, casted and retrieved, or vertically jigged with a natural bait attached. Of course, there is no reason to wait for 2020. Circle hooks work. The DMF proposal to open the commercial season earlier because last year's quota was not filled does not reflect a widespread view that the cause is a decline in the stocks, as opposed to time just ran out. Fishermen ought to take advantage of the opportunity to express an opinion on the slate of rule changes and email Director Pierce. Back in the day when I actually used to fish for stripers a lot I started tying flies on circle hooks and noticed no decrease in hook ups so I don't really have a problem if they became mandatory. I did try using circle hooks for bonito and they were terrible, lots of hits and hardly any hook ups. Just my 2 cents. I have used circle hooks for years, and I'm not sure I see the advantage. I still gut hook a lot of fish, and the circle hooks are harder to remove when the fish swallows them. I was actually thinking of going back to J hooks for this reason. These comments are insightful and very persuasive. Massachusetts Fish and Game should be evaluating these regs and seeking comment from people who are "in the know" like Mr. Gilkes and these other knowledgeable contributors. There is always a disconnect between the bureaucratic regulators and the real fishing public. In my opinion they should have a 3year moratorium on harvesting, across the board, no exceptions. Enough of Couch/Computer/Desk fisherman making the rules for the 15% of Com permit Holders that actually do all the Commercial fishing. All these people squawking about this are the ones NOT doing the fishing. The Gaff theory is just that.... a theory. The rec folks do more damage to the fishery then ALL the commercial guys do combined. I personally know if a fish is big enough 34" to put a gaff in it. For instance 0% of the 3,000 + pounds of Striper I brought aboard with a gaff was undersized..0%....If it is close I lip the fish....We are not all who you folks think. We are not the BassBoogieman. We are Anglers learning how to get the best angle to increase our catch. The Circle hook idea is just another cloaked way of trying to get the YOYo guys out of business. Whats next? ...Not to sound like a broken record but.....Enforce the rules on the books already before making senseless new ones.. And as far as making the Derby C&R.... Start your own tourney and make it any way you like. with your own PC rules. Gaffs. Really? You folks are just getting around to banning that ?